For other uses, see Baibars (disambiguation). Baibars or Baybars (Arabic: الملك الظاهر ركن الدين بيبرس البندقداري‎, al-Malik al-Ẓāhir Rukn al-Dīn Baybars al-Bunduqdārī) (1223/1228 – 1 July 1277), of Turkic Kipchak origin – nicknamed Abu al-Futuh and Abu l-Futuhat (Arabic: أبو الفتوح; English: Father of Conquest, referring to his victories) — was the fourth sultan of Egypt in the Mamluk Bahri dynasty. He was one of the commanders of the Egyptian forces that inflicted a defeat on the Seventh Crusade of King Louis IX of France. He also led the vanguard of the Egyptian army at the Battle of Ain Jalut in 1260, which marked the first substantial defeat of the Mongol army and is considered a turning point in history. The reign of Baibars marked the start of an age of Mamluk dominance in the Eastern Mediterranean and solidified the durability of their military system. He managed to pave the way for the end of the Crusader presence in the Levant and reinforced the union of Egypt and Syria as the region's pre-eminent Muslim state, able to fend off threats from both Crusaders and Mongols, and even managed to subdue the kingdom of Makuria, which was famous for being unconquerable by previous Muslim empire invasion attempts. As Sultan, Baibars also engaged in a combination of diplomacy and military action, allowing the Mamluks of Egypt to greatly expand their empire. In his native Turkic language, Baibars' name means "great panther" or "lord panther" (see also Wiktionary: bay "rich person, noble" + pars "leopard, panther"). Possibly based on the Turkic meaning of his name, Baibars used the panther as his heraldic blazon, and placed it on both coins and buildings. The lion/panther used on the bridge built by Baibars near al-Ludd (today's Lod) plays with a rat, which may be interpreted to represent Baibars' Crusader enemies. Baibars was a Cuman born in the Dasht-i Kipchak, between the Edil (Volga) and Yaiyk (Ural) rivers. There is a discrepancy in Ibn Taghrībirdī's dating of his birth, since he says it took place in 625 AH (12 December 1227–29 November 1228) and also that Baibars was about 24 years old in 1247, which would put his birth closer to 1223. He belonged to the Barli tribe. According to a fellow Cuman and eyewitness, Badr al-Din Baysari, the Barli fled the armies of the Mongols, arranging to settle in the Second Bulgarian Empire. They crossed the Black Sea from either Crimea or Alania, where they had settled in the meantime, to Bulgaria about 1242. After a time, the Bulgarians turned on the Cumans and attacked them. Baysari and Baibars were among the captives and were sold into slavery in the Sultanate of Rum at the slave market in Sīwās. He was sold at Aleppo to 'Alā’ al-Dīn Īdīkīn al-Bunduqārī, an Egyptian of high rank, who brought him to Cairo. In 1247, al-Bunduqārī was arrested and the sultan of Egypt, As-Salih Ayyub, confiscated his slaves, including Baibars. Baibars was described as fair-skinned in contrast to the "swarthy" skin of the native Egyptians, broad-faced with small eyes, very tall (which was typical in both Arabic and European descriptions of Turkic men), and having a cataract in one of his eyes. The Mamluks under Baibars (yellow) fought off the Franks and the Mongols during the Ninth Crusade. Baibars was a commander of the Mamluks under the Ayyubids. He may have been involved in the significant victory of the Egyptian army at the Battle of La Forbie, east of Gaza in 1244 in the aftermath of the Sixth Crusade. In around 1250 he defeated the Seventh Crusade of Louis IX of France. He was also involved in the Battle of Al Mansurah, where he employed an ingenious strategy in ordering the opening of a gate to let the crusader knights enter the town; the crusaders rushed into the town that they thought was deserted to find themselves trapped inside. They were besieged from all directions by the Egyptian forces and the town population, and suffered heavy losses. Robert of Artois, who took refuge in a house, and William of Salisbury were both killed, along with most of the Knights Templar. Only five Templar Knights escaped alive. Baibars was still a commander under Sultan Qutuz at the Battle of Ain Jalut in 1260, when he decisively defeated the Mongols. After the battle, Sultan Qutuz (aka Koetoez) was assassinated while on a hunting expedition. It was said that Baibars was involved in the assassination because he expected to be rewarded with the governorship of Aleppo for his military success, but Qutuz, fearing his ambition, refused to give him the post. Baibars succeeded Qutuz as Sultan of Egypt. Once Baibars had ascended to the Sultanate, his authority was soon confirmed without any serious resistance, except from Sinjar al-Halabi, another Mamluk amir who was popular and powerful enough to claim Damascus. Also, the threat from the Mongols was still serious enough to be considered as a threat to Baibars' authority. However, Baibars first chose to deal with Sinjar,[clarification needed] and marched on Damascus. 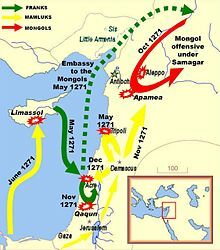 At the same time the princes of Hama and Homs proved able to defeat the Mongols in the First Battle of Homs, which lifted the Mongol threat for a while. On 17 January 1261, Baibars' forces were able to rout the troops of Sinjar outside Damascus, and pursued the attack to the city, where the citizens were loyal to Sinjar and resisted Baibars, although their resistance was soon crushed. After suppressing the revolt of Sinjar, Baibars then managed to deal with the Ayyubids, while quietly eliminating the prince of Kerak. Ayyubids such as Al-Ashraf Musa, Emir of Homs and the Ayyubid Emir Dynasty of Hama Al-Mansur Muhammad II), who had earlier staved off the Mongol threat, were permitted to continue their rule in exchange for their recognizing Baibars' authority as Sultan. After the Abbasid caliphate in Iraq was overthrown by the Mongols in 1258 when they conquered and sacked Baghdad, the Muslim world lacked a caliph, a theoretically supreme leader who had sometimes used his office to endow distant Muslim rulers with legitimacy by sending them writs of investiture. Thus, when the Abbasid refugee Abu al-Qasim Ahmad, the uncle of the last Abbasid caliph al-Musta‘sim, arrived in Cairo in 1261, Baibars had him proclaimed caliph as al-Mustansir II and duly received investiture as sultan from him. Unfortunately, al-Mustansir II was killed by the Mongols during an ill-advised expedition to recapture Baghdad from the Mongols later in the same year. In 1262, another Abbasid, allegedly the great-great-great grandson of the Caliph al-Mustarshid, Abu al-‘Abbas Ahmad, who had survived from the defeated expedition, was proclaimed caliph as al-Hakim I, inaugurating the line of Abbasid caliphs of Cairo that continued as long as the Mamluk sultanate, until 1517. Like his unfortunate predecessor, al-Hakim I also received the formal oath of alliegance of Baibars and provided him with legitimation. While most of the Muslim world did not take these caliphs seriously, as they were mere instruments of the sultans, they still lent a certain legitimation as well as a decorative element to their rule. As sultan, Baibars engaged in a lifelong struggle against the Crusader kingdoms in Syria, in part because the Christians had aided the Mongols. He started with the Principality of Antioch, which had become a vassal state of the Mongols and had participated in attacks against Islamic targets in Damascus and Syria. In 1263, Baibars laid siege to Acre, the capital of the remnant of the Kingdom of Jerusalem, although the siege was abandoned when he sacked Nazareth instead. He used siege engines to defeat the Crusaders in battles such as the Fall of Arsuf from March 21 to April 30. After breaking into the town he offered free passage to the defending Knights Hospitallers if they surrendered their formidable citadel. The Knights accepted Baibars' offer but were enslaved anyway. Baibars razed the castle to the ground. He next attacked Athlith and Haifa, where he captured both towns after destroying the crusaders' resistance, and razed the citadels. Later, in 1266, Baibars invaded the Christian country of Cilician Armenia which, under King Hethum I, had submitted to the Mongol Empire. After defeating the forces of Hethum I in the Battle of Mari, Baibars managed to ravage the three great cities of Mamistra, Adana and Tarsus, so that when Hetoum arrived with Mongol troops, the country was already devastated. Hetoum had to negotiate the return of his son Leo by giving control of Armenia's border fortresses to the Mamluks. In 1269, Hetoum abdicated in favour of his son and became a monk, but he died a year later. Leo was left in the awkward situation of keeping Cilicia as a subject of the Mongol Empire, while at the same time paying tribute to the Mamluks. This isolated Antioch and Tripoli, led by Hethum's son-in-law, Prince Bohemond VI. After successfully conquering Cilicila, Baibars in 1267 settled his unfinished business with Acre, and continued the extermination of remaining crusader garrisons in the following years. In 1268, he besieged Antioch, capturing the city on 18 May. Baibars had promised to spare the lives of the inhabitants, but he broke his promise and had the city razed, killing or enslaving much of the population after the surrender. prompting the fall of the Principality of Antioch. The massacre of men, women, and children at Antioch "was the single greatest massacre of the entire crusading era." Priests had their throats slit inside their churches, and women were sold into slavery. Then he continued to Jaffa, which belonged to Guy, the son of John of Ibelin. Jaffa fell to Baibars on 7 March after twelve hours of fighting; most of Jaffa's citizens were slain, but Baibars allowed the garrison to go unharmed. After this he conquered Ashkalon and Caesarea. In 1271, after Baibars captured the smaller castles in the area, including Chastel Blanc, he besieged Krak des Chevaliers castle, held by the Hospitallers, on 30 March. Peasants who lived in the area had fled to the castle for safety and were kept in the outer ward. As soon as Baibars arrived he began erecting mangonels, powerful siege weapons which he would turn on the castle. According to Ibn Shaddad, two days later the first line of defences was captured by the besiegers; he was probably referring to a walled suburb outside the castle's entrance. After a lull of ten days, the besiegers conveyed a letter to the garrison, supposedly from the Grand Master of the Knights Hospitaller in Tripoli, which granted permission for them to surrender. The garrison capitulated and the Sultan spared their lives. The new owners of the castle undertook repairs, focused mainly on the outer ward. The Hospitaller chapel was converted to a mosque and two mihrabs were added to the interior. Baibars then turned his attention to Tripoli, but he interrupted his siege there to call a truce in May 1271. The fall of Antioch had led to the brief Ninth Crusade, led by Prince Edward of England, who arrived in Acre in May 1271 and attempted to ally himself with the Mongols against Baibars. So Baibars declared a truce with Tripoli, as well as with Edward, who was never able to capture any territory from Baibars anyway. According to some reports, Baibars tried to have Edward assassinated with poison, but Edward survived the attempt and returned home in 1272. In 1277, Baibars invaded the Seljuq Sultanate of Rûm, then controlled by the Ilkhanate Mongols. He defeated a Mongol army at the Battle of Elbistan and captured the city of Kayseri. Baibars himself went with a few troops to deal with the Mongol right flank that was pounding his left wing. Baibars ordered a force from the army from Hama to reinforce his left. The large Mamluk numbers were able to overwhelm the Mongol force, who instead of retreating dismounted from their horses. Some Mongols were able to escape and took up positions on the hills. Once they became surrounded they once again dismounted, and fought to the death. During the celebration of victory, Baybars said that "How can I be happy. Before I had thought that I and my servants would defeat the Mongols, but my left wing was beaten by them. Only Allah helped us". The possibility of a new Mongol army convinced Baibars to return to Syria, since he was far away from his bases and supply line. As the Mamluk army returned to Syria the commander of the Mamluk vanguard, Izz al-Din Aybeg al-Shaykhi, deserted to the Mongols. Pervâne sent a letter to Baibars asking him to delay his departure. Baibars chastised him for not aiding him during the Battle of Elbistan. Baibars told him he was leaving for Sivas to mislead Pervâne and the Mongols as to his true destination. Baibars also sent Taybars al-Waziri with a force to raid the Armenian town of al-Rummana, whose inhabitants had hidden[clarification needed] the Mongols earlier. Baibars died in Damascus on 1 July 1277. His demise has been the subject of some academic speculation. Many sources agree that he died from drinking poisoned kumis that was intended for someone else. Other accounts suggest that he may have died from a wound while campaigning, or from illness. He was buried in the Az-Zahiriyah Library in Damascus. Baibars married several women and had seven daughters and three sons. Two of his sons, al-Said Barakah and Solamish, became sultans. Rage and sorrow are seated in my heart...so firmly that I scarce dare to stay alive. It seems that God wishes to support the Turks to our loss...ah, lord God...alas, the realm of the East has lost so much that it will never be able to rise up again. They will make a Mosque of Holy Mary's convent, and since the theft pleases her Son, who should weep at this, we are forced to comply as well...Anyone who wishes to fight the Turks is mad, for Jesus Christ does not fight them any more. They have conquered, they will conquer. For every day they drive us down, knowing that God, who was awake, sleeps now, and Muhammad waxes powerful. Baibars also played an important role in bringing the Mongols to Islam. He developed strong ties with the Mongols of the Golden Horde and took steps for the Golden Horde Mongols to travel to Egypt. The arrival of the Mongol's Golden Horde to Egypt resulted in a significant number of Mongols accepting Islam. Baibars was a popular ruler in the Muslim World who had defeated the crusaders in three campaigns, and the Mongols in the Battle of Ain Jalut which many scholars deem of great macro-historical importance. In order to support his military campaigns, Baibars commissioned arsenals, warships and cargo vessels. He was also arguably the first to employ explosive hand cannons in war, at the Battle of Ain Jalut. His military campaign also extended into Libya and Nubia. He was also an efficient administrator who took interest in building various infrastructure projects, such as a mounted message relay system capable of delivery from Cairo to Damascus in four days. He built bridges, irrigation and shipping canals, improved the harbours, and built mosques. He was a patron of Islamic science, such as his support for the medical research of his Arab physician, Ibn al-Nafis. As a testament of a special relationship between Islam and cats, Baibars left a cat garden in Cairo as a waqf, providing the cats of Cairo with food and shelter. Its legacy of domesticated cats in Cairo is still seen to this day. His memoirs were recorded in Sirat al-Zahir Baibars ("Life of al-Zahir Baibars"), a popular Arabic romance recording his battles and achievements. He has a heroic status in Kazakhstan, as well as in Egypt and Syria. Al-Madrassa al-Zahiriyya is the school built adjacent to his Mausoleum in Damascus. The Az-Zahiriyah Library has a wealth of manuscripts in various branches of knowledge to this day. Baibars figures prominently in the story "The Sowers of the Thunder" by Robert E. Howard. While liberties are taken with history for the sake of the tale, and many characters and events are purely imaginary, his character is fairly close to the folkloric depiction and the general flow of history is respected. Baibars is one of the main characters of Robyn Young's books, Brethren (starting shortly before he becomes Sultan) and Crusade. According to Harold Lamb, Haroun of Baghdad in the Arabian Nights was really Baibars of Cairo. Baibars is one of the central characters in Lebanese- American author Rabih Alameddine's The Hakawati. Baibars is one of the characters in The Children of the Grail books by Peter Berling. Baibars is a central character in "The Saracen" – Novel by Robert Shea, 1989 Historic Fiction. ^ a b Heghnar Zeitlian Watenpaugh (2004). The image of an Ottoman city: imperial architecture and urban experience in Aleppo in the 16th and 17th centuries. Brill. p. 198. ISBN 90-04-12454-3. ^ Caroline Williams (2008). Islamic Monuments in Cairo: The Practical Guide; New Revised Edition. The American University in Cairo Press. p. 185. ISBN 9789774162053. ^ Niall Christie (2014). Muslims and Crusaders: Christianity’s Wars in the Middle East, 1095–1382, from the Islamic Sources. Seminar Studies (first ed.). Routledge. p. 121, Plate 8. ISBN 9781138022744. ^ Dimitri Korobeinikov (2008), "A Broken Mirror: The Kıpçak World in the Thirteenth Century", in Florin Curta; Roman Kovalev, The Other Europe in the Middle Ages: Avars, Bulgars, Khazars, and Cumans, Leiden: Brill, pp. 379–412 . ^ Maalouf, Amin (1984). The crusades through Arab eyes. Saqi Books. p. 248. ISBN 978-0-86356-023-1. ^ Lord of Joinville, 110, part II. Skip Knox, Egyptian Counter-attack, The Seventh Crusade. ^ According to Matthew Paris, only 2 Templars, 1 Hospitaller and one ‘contemptible person’ escaped. Matthew Paris, Louis IX's Crusade, p. 14/ Vol. 5. ^ a b Runciman, Steven (1987). A History of the Crusades: The Kingdom of Acre and the Later Crusades quoting Magrisi Sultans, I, i, p. 116; Abu al Fida pp. 145–50; Bar Hebraeus p. 439. p. 316. ^ Dalrymple, William (3 April 1989). "In Xanadu". Penguin Books India. Retrieved 3 April 2018 – via Google Books. ^ The Crusaders in the East quoting El-Aini ii. 220; Makrizi i, ii. 8. 1987. p. 338. ^ Winter, Michael; Levanoni, Amalia (3 April 2018). "The Mamluks in Egyptian and Syrian Politics and Society". BRILL. Retrieved 3 April 2018 – via Google Books. ^ Madden, supra at 168. ^ The Later Crusades, 1189–1311. Univ of Wisconsin Press. 1969. p. 557. ISBN 9780299048440. ^ F. Broadbridge, Anne (2008). Kingship and Ideology in the Islamic and Mongol Worlds Cambridge Studies in Islamic Civilization. p. 59. ISBN 9780521852654. ^ Howard, Jonathan (2011). The Crusades: A History of One of the Most Epic Military Campaigns of All Time. ^ El Hareir, Mbaye, Idris , Ravane (2011). The Spread of Islam Throughout the World. p. 300. ^ Hopkins.Peter (3 June 2014). "Kenana Handbook of Sudan". Routledge. Retrieved 3 April 2018 – via Google Books. ^ Young, Robyn (2007). Crusade. Dutton. p. 484. ^ Albert Z. Iskandar, "Ibn al-Nafis", in Helaine Selin (1997), Encyclopaedia of the History of Science, Technology, and Medicine in Non-Western Cultures, Kluwer Academic Publishers, ISBN 0-7923-4066-3. ^ Campo, Juan Eduardo (2009). Encyclopedia of Islam. Infobase Publishing. ISBN 1438126964. ^ leonardyoung.com, Leonard Young. "Lorraine Chittock". cairocats.com. Retrieved 3 April 2018.